Intermediate/Advanced. 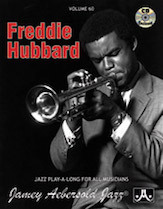 11 bandstand favorites composed and/or recorded by one of Jazz's greatest trumpet innovators. Different than most of our other volumes where many tunes incorporate new musical influences and styles such as rock, latin, and fusion. Perfect for anyone wishing to "spice up" their repertoire. 6 high-powered professional musicians back you up in a variety of combinations to give every song a different feel and make the music come alive!